Can you imagine walking through the wilderness for 40 years? Imagine walking around the same mountain, whingeing and complaining, and suffering all sorts of discomforts for FORTY YEARS!!! You couldn't imagine tolerating that these days, ay. Not in this fast-service, gotta-have-it-yesterday world we live in. These days we'd call a cab, jump on a plane or head off to a new destination if we couldn't get what we wanted fast enough. Whatever gets us there, or somewhere, or ANYWHERE!!! fast - that's what we want. No matter what the cost! Of course, if we can't get the cab or plane or train or even skates to our chosen destination we won't bother going there and we'll miss out on the dream, but, hey, settling for 'ANYWHERE!!!' or 'anything' is better than having to wait alllllll thaaaaat tiiiiime for 'the dream', isn't it...! Many times we'll not just give up on the destination, or the dream, or God's promises, though; but on Him, too. We want what we want and we want it when we want it and if we don't get it we'll grumble and groan until we do or we'll talk ourselves out of wanting 'that' and go after something new; something else that will gratify our flesh asap! No matter what the cost! Those in the above verses, who didn't make it out of the wilderness, died in their grumbling, and God passed 'the promise' on to the next generation... Sad, ay. What is your dream...? His promises to you? What is your wilderness? What is it you're grumbling over? In what way are you being disobedient and, because of this, cannot seem to enter God's rest, or peace? 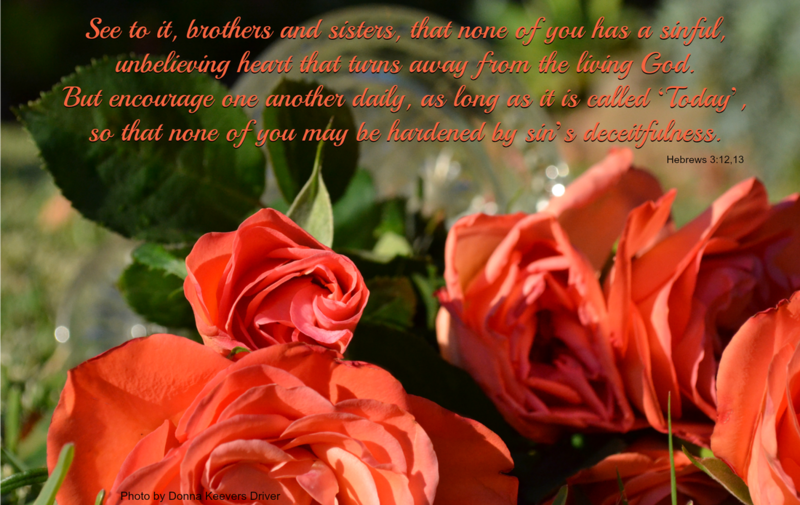 What have you hardened your heart over? Do you seriously want to spend the next 40 years or so wandering aimlessly around the same mountain? through the wilderness? missing out on God's promises and on your dreams? Is impatience, grumbling, unforgiveness, and so on, really worth losing the dream, the promises, peace/God's rest and God over...? Last week I was at the point of giving up on my marriage. I was over it. I had been walking the 'Finding Our Identity' walk over on my main website, and, in the midst of it - while having to deal with my ego - I got fed up with man's ego, and couldn't be bothered pampering it anymore, so much so that my heart was hardening and my love for my husband was cooling off pretty darn quickly...until I surrendered my heart to God. The flowers in the image above were given to me by my husband - along with a cross necklace. He left them for me, on my desk, while I was out - before he had to go to work. He gave them to me the night after he found a bit of jealousy in his heart and I found it in my heart not to care. We didn't argue; rather, I bit my tongue and he just gave 'that look' that declared he was not pleased. With Tim's heart threatening to harden, and with mine calling for that cab mentioned above, I hissed at God, "Of all the times for this to come against me!!" then He echoed back, ever so patiently, and, like me, referring to the 'finding my identity' journey and the ego-dealing section of it, said, "Of course this would come against you at this time..." and then I knew it was the enemy trying to hinder my journey, and my marriage, and I laughed, knowing I should've expected it.